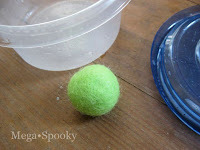 TINY CRAFTS OF ALL KINDS AND MORE: Here is how to make felted balls. I've been seeing tons of projects for felted acorns again this year. 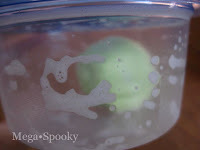 Here's and easy way to make the felted balls you need for that project. And it's great to do with kids. 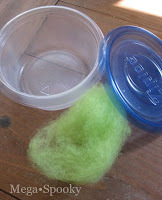 They love the "magic" that happens during the felting process and this technique contains the soapy water mess. 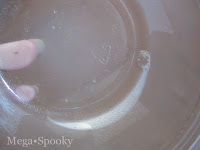 Add a drop or two of dish soap that been watered down (50/50). But you really only need a drop or two or it will get way too soapy! Also a little warm water from your tap. 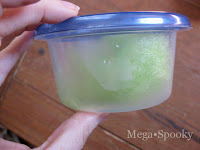 Then seal the container. Soon you'll see the wool getting smaller and forming a little ball. When your wool ball feels firm and all the fibers have come together your done. Rise and let dry. Once they are dry they are ready for felted acorns, or any other projects you can think of!